The National Commission of Culture and the Arts (NCCA), the country’s prime cultural agency led by its chairman National Artist Virgilio S. Almario, executive director Rico S. Pableo and deputy executive director Marichu Tellano, spearheads the celebration of National Arts Month via a grand opening ceremony at the Rizal Park, Manila, on February 3 and 4. The theme of this year’s festivity is "Ani ng Sining, Alab ng Sining" (Harvest of the Arts, Flame of Art), emphasizing the bounty of artistic endeavors in the Philippines and the passion of Filipino artists and cultural workers. Expect February to be filled with various events and activities that show the boundless creativity of Filipinos all over the country, led by NCCA’s Subcommission on the Arts (SCA), with its seven national committees—Architecture, Cinema, Dance, Literary Arts, Music, Dramatic Arts and Visual Arts—which will each have their own flagship projects. The first day of opening, titled “Labs kita Sabado,” features local bands rocking the crowd at 1 PM, followed by cultural groups from 15 schools, showcasing dances and other performances, including the University of Santo Tomas Faculty of Arts and Letters and Conservatory of Music, the University of the Philippines Diliman and Mapua University Manila. By 6 PM, there will be free public screening of films. The next day, February 4, there will be an opening ritual, and there will booths, offering workshops and other activities, set up at the park. There will be a baybayin workshop, a tertulya, story-telling sessions, photography and graphic design workshops, music and dance workshops, t-shirt printing, film showings, cosplay, kite-making and portrait sketching. 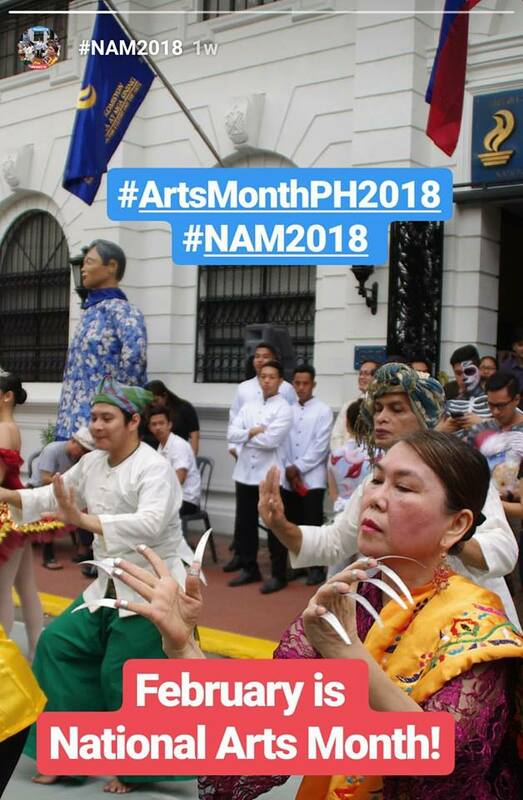 The annual celebration of National Arts Month began with the signing of Presidential Proclamation 683, in 1991, declaring February as National Arts Month. Over the years, NCCA, as well as private and government agencies, has been organizing events and activities to highlight the artistic brilliance of the Filipinos.